Exactly one year ago today, a widespread outage hit Google’s GrandCentral (recently upgraded and relaunched as Google Voice). At the time, we wrote “If you want to be a phone company, and get your users to rely on you to manage all of your incoming calls, this simply cannot happen”. A year later those words ring true as a widespread outage has hit another VoIP provider: Ooma, the device that offers users free phone service for life. Beginning around five hours ago, Ooma users across the country began to Tweet that their service wasn’t working. Ooma technicians have been regularly posting updates to the site’s official forums, which indicates that an issue stemming from an internet outage is to blame (the company’s CMO has tweeted that “a route out of our datacenter has been severed”). Twitter users are reporting sporadic success using the service in the last few minutes, which appears to have been down entirely earlier this afternoon. Ooma has had a somewhat checkered history, struggling for years to gain market-share as consumers largely scoffed at its high pricetag (the service may have been free for life, but the $400 price of admission to purchase the unit was simply too steep for most people). But more recently, the company has been on the rebound after lowering its price to $250 per unit and closing a third round of funding last September. It’s been a tough day. Yes we at Ooma take this VERY SERIOUSLY. It appears that one of the routes out of our datacenter (and that of several other SV companies) has been experiencing problems. We are attempting fix the problem, but the challenge is that it’s not our network leg or hardware that is the problem. The service if fluctuating up and down as we try to establish new routes around the problem. As soon as we find a permanent fix we’ll post notices on our blog and on twitter. Our sincere apologies to those impacted this afternoon. 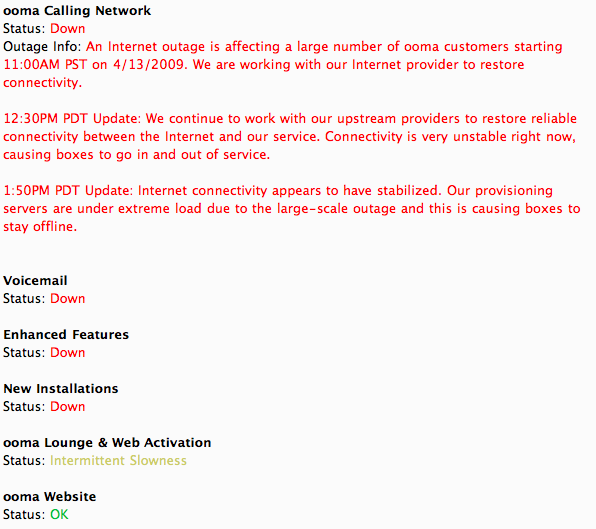 Update 2: As of 5:15 PM PST, Ooma reports that its service is back to normal.